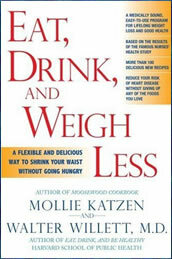 Eat, Drink, and Weigh Less is written by Walter Willet, M.D, head of the department of nutrition at the Harvard School of Public Health, and Mollie Katzen, author of the New York Times bestselling Moosewood Cookbook. The goal of the authors is to present dieters with nutritional advice that is based on up-to-date research, while at the same time providing healthy recipes that taste great. The Eat Drink and Weigh Less plan is based largely on the Mediterranean diet with some adjustments to make it easier to follow and to support weight loss. You are encouraged to eat a plant-based diet because this is better for your health, but animal products including fish, low-fat dairy and lean meat are permitted in moderate amounts. Dieters are provided with a 21-day program that includes recipes that emphasize whole foods such as fruit, vegetables, legumes and grains. You will need to prepare most of your own meals but if you don’t have the time you can have a “fallback meal”, which contains a portion of protein, two or more green vegetables, one orange vegetable and a serving of whole grains. Walter Willett and Mollie Katzen encourage dieters to eat breakfast every day and to limit the intake of dessert to an occasional treat. If dieters enjoy wine they can drink one glass a day because moderate intakes have been associated with a positive effect on health. Fruit, vegetables, whole grain bread, whole grain pasta, brown rice, millet, quinoa, chickpeas, kidney beans, almonds, sunflower seeds, peanut butter, low-fat cheese, yogurt, eggs, fish, poultry, lean meat, avocado, olive oil, red wine. Walter Willett and Mollie Katzen highlights the importance of exercise, however Eat, Drink and Weigh Less doesn’t provide a detailed exercise guidance or a fitness plan. Eat, Drink, and Weigh Less: A Flexible and Delicious Way to Shrink Your Waist retails at $15.99. Click here to purchase a discounted copy of the book. Promotes a healthy lifestyle approach to weight management. Encourages the intake of a wide variety of healthy foods including fruit, vegetables, legumes and whole grains. Does not require dieters to give up their favorite foods such as desserts and wine. Encourages the intake of breakfast, which has been associated with successful weight loss. Written by Walter Willett, a well-respected medical doctor and based on scientific research. Recipes are contributed by a best-selling cookbook author Mollie Katzen. Includes a 21-day meal plan that can be customized to suit individual preferences. Will involve more time to be spent planning and preparing meals. Some of the recipes are complicated and contain hard-to-find ingredients. Meal plans do not include calorie calculations or information about carbohydrate content. May take a while for weight loss results to become apparent. Eat, Drink and Weigh Less is an approach to healthy weight loss that includes a 21-day meal plan with flavorful recipes. The major drawback is that it will be necessary to spend a fair amount of time in the kitchen, however dieters who invest in this program will be rewarded with improvements in general health as well as developing effective tools for lifelong weight management.